Roskilde Festival Højskole (Roskilde Festival Folk High School) has opened – the first new-build general folk high school in Denmark for 50 years. 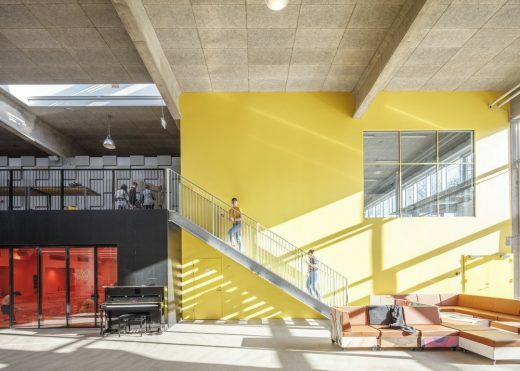 The new folk high school was designed by the architecture firms COBE from Denmark and MVRDV from the Netherlands, the same partnership that created the nearby Ragnarock – Museum for pop, rock and youth culture in the creative Musicon district in the city of Roskilde, Denmark. 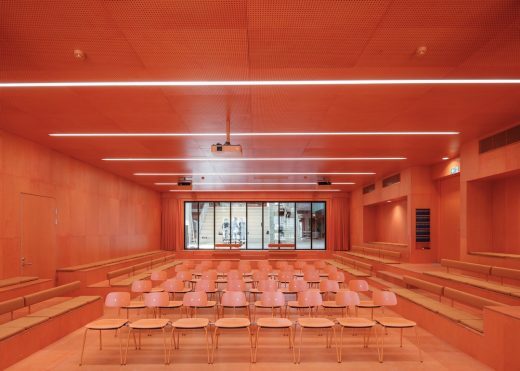 The opening of Roskilde Festival Folk High School adds a new chapter to the history of Danish education as the first new-build general folk high school in Denmark for 50 years. 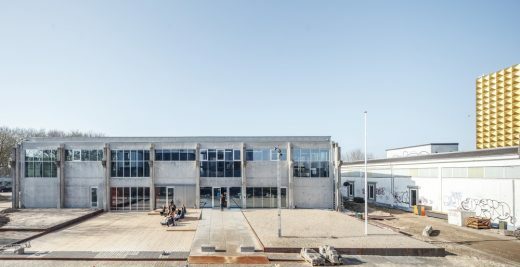 The school is situated in Hall 10, a former production hall for the Danish concrete manufacturer Unicon, in the creative district Musicon in the city of Roskilde. The new 5.578 sqm facility offers students and teachers a setting for learning and creative projects in a folk high school based on the same ideals as the annual music festival Roskilde Festival, which is based on voluntary engagement, a humanitarian focus and creativity. The festival is organized by the Roskilde Festival Association and is created by 30,000 volunteers. All profits from the festival are donated to humanitarian, non-profit and cultural work for thebenefit of especially children and young people. In 2019 the music festival had over 130,000 participants and volunteers, which makes Roskilde Festival Denmark’s fourth largest ’city’ measured in population. A DANISH FOLK HIGH SCHOOL Based on the ideas of the enlightenment during the early 1800s, the Danish folk high school movement was conceived by the Danish writer and teacher N. F. S. Grundtvig (1783–1872). The school has no fixed curriculum and no exams, and both students and teachers live at the school during a course. FROM CONCRETE FACTORY TO CREATIVE LEARNING SPACES In this project COBE and MVRDV renovated and opened the former factory hall up by adding large windows while preserving the existing concrete girders and pillars in their raw state as remnants of the former production hall, Hall 10. Throughout the building in its current state, one senses a clear contrast between new and old. 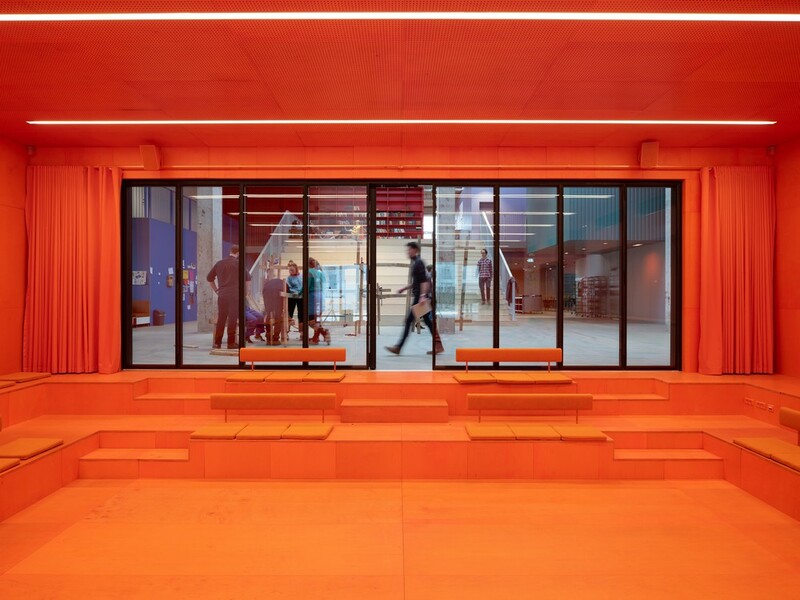 The hall, which was originally a single open space, now houses 16 large boxes in different colours and materials inspired by the festival’s colourful universe. The boxes contain a variety of functions, such as workshops for the school’s artistic courses, stages, music studios, dance hall, classrooms, staff room and a lecture hall with a capacity of 150 people. 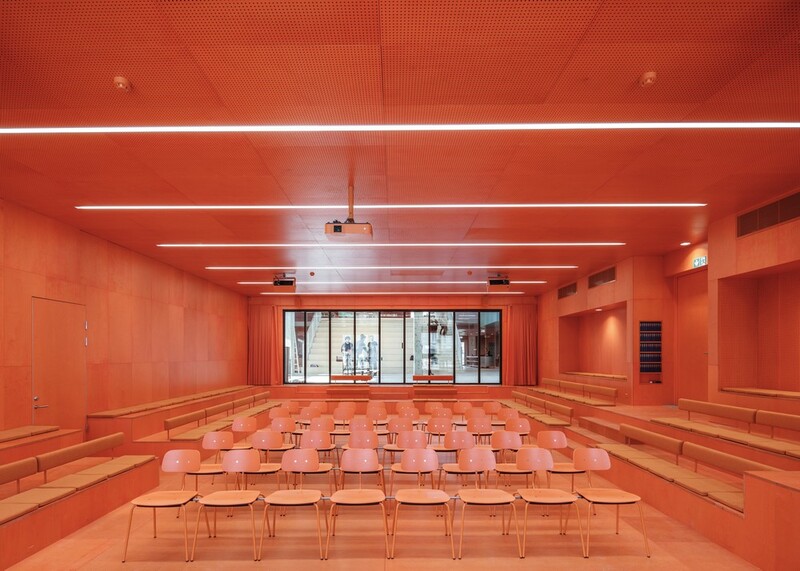 Each box is designed as a distinct space that provides an optimal setting for the students to engage in the different subjects. 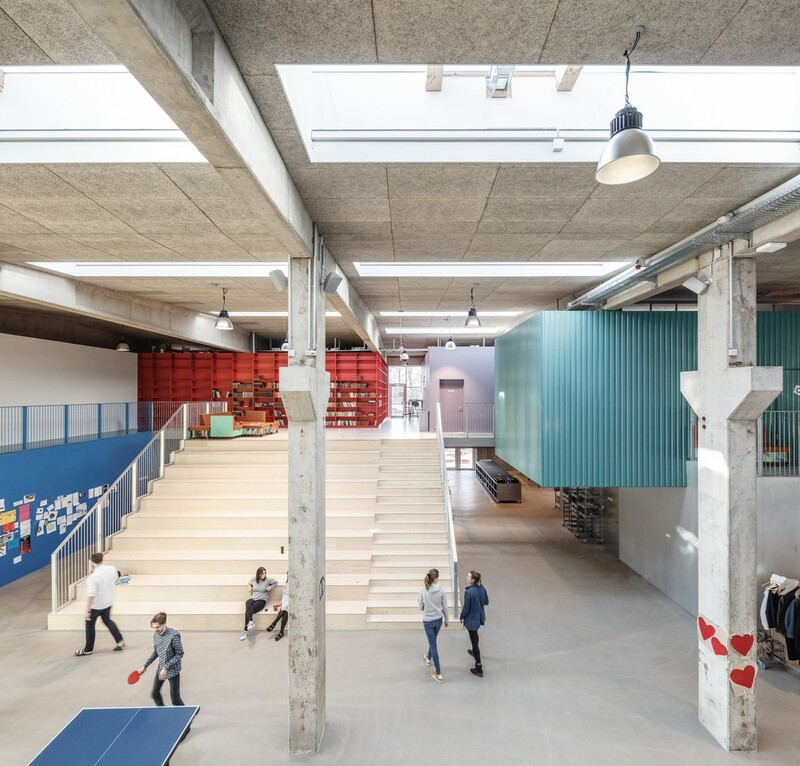 All the boxes address the large common room in the middle of the old production hall, which has a ceiling height of eight metres. This area also contains the school’s communal facilities, such as the dining hall and assembly hall. 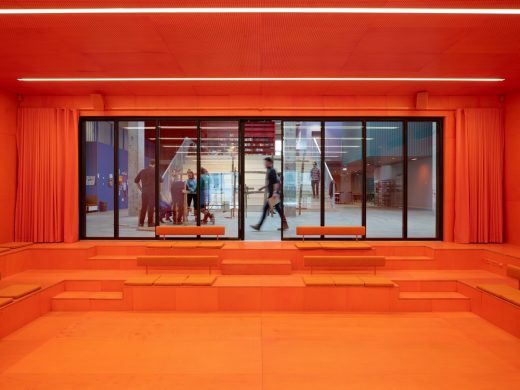 The boxes are stacked two high in a staggered formation that gives rise to interesting and intimate spaces where the school’s community can develop and thrive in the ‘space in between’. ”Our design, just like the school itself, was inspired by the spirit of the Roskilde Festival. It is all about music, art, activism – but most of all, freedom. 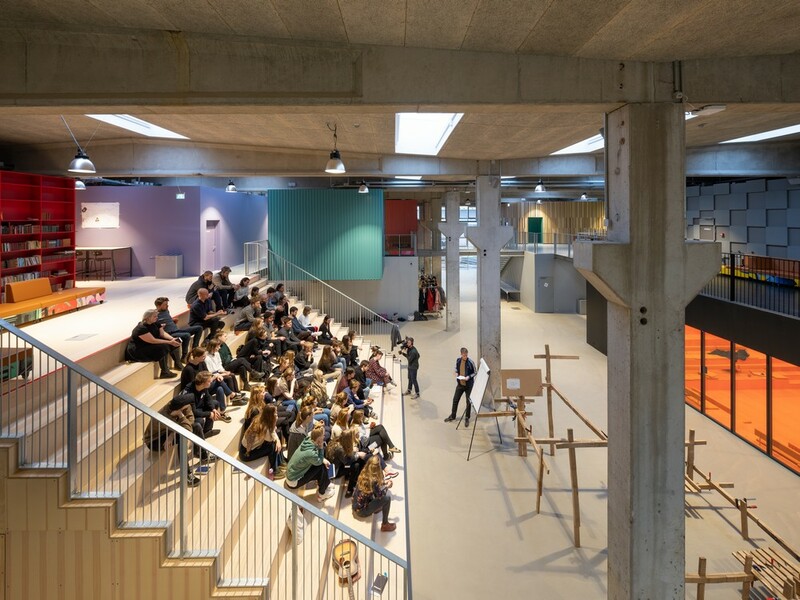 The festival combines ‘having a good time’ with innovation in an informal way, giving a special vibe that we wanted to capture in the design of the interior of the school,” says Jacob van Rijs, partner and founder of MVRDV. 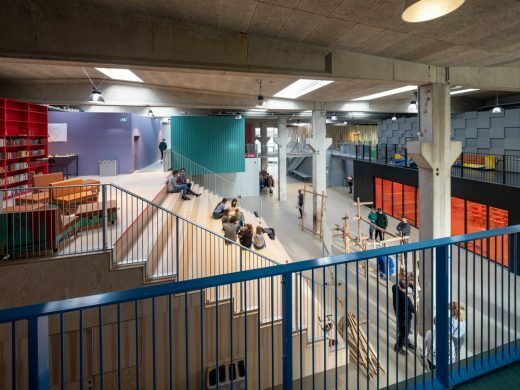 A DYNAMO IN THE MUSICON DISTRICT Roskilde Festival Folk High School is an important part of the development of Musicon, which is designed to be a vibrant and creative district. In addition to the folk high school the project also includes dwellings for students and teachers. The student dwellings are situated in front of the folk high school in two separate buildings. They consist of a number of stacked modules with sinusoidal and trapezoidal metal cladding that has clear references to the area’s history as an industrial production area. Each student block is four storeys high and tied together by an exterior system of gangways. 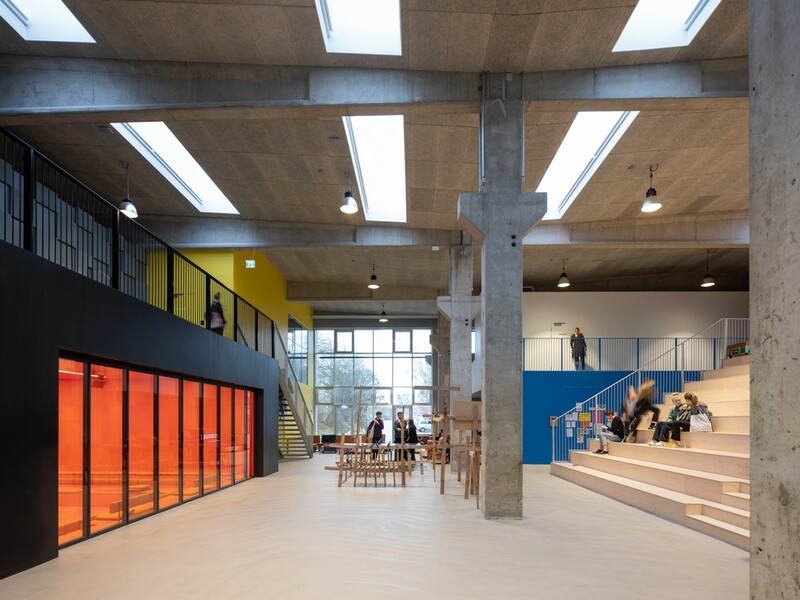 From the dwellings, the students have a view of the neighbouring Ragnarock Museum with the golden aluminium facade to one side and the skate section of the Rabalder Park to the other. Each floor is home to 15–20 students. 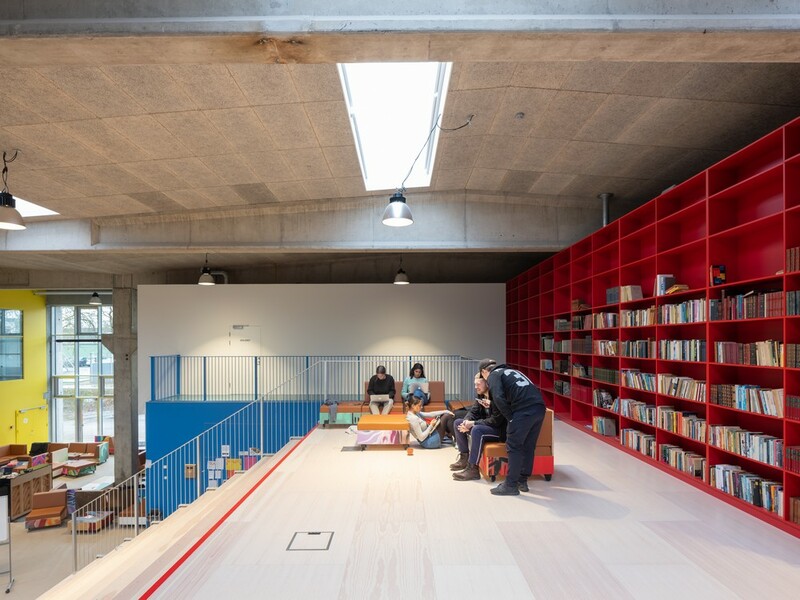 In addition to their personal dwellings, the students have access to a common space with a kitchen, lounge area and working niches. Next to the student blocks there are four row houses with dwellings for the teachers at the folk high school. 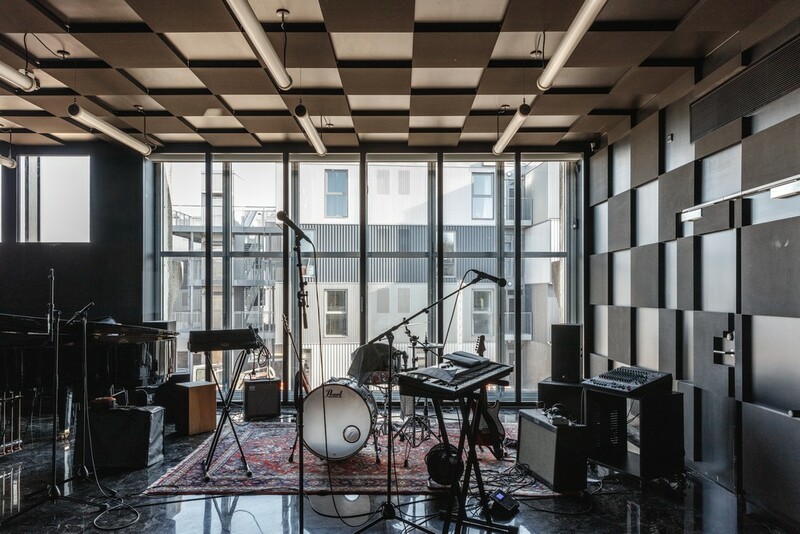 The row houses too are based on room-sized prefab modules with sinusoidal and trapezoidal cladding. A HOLISTIC PLAN FOR ROCKMAGNETEN COBE and MVRDV won the competition for the so-called ROCKmagneten (Rock Magnet) area in 2011. 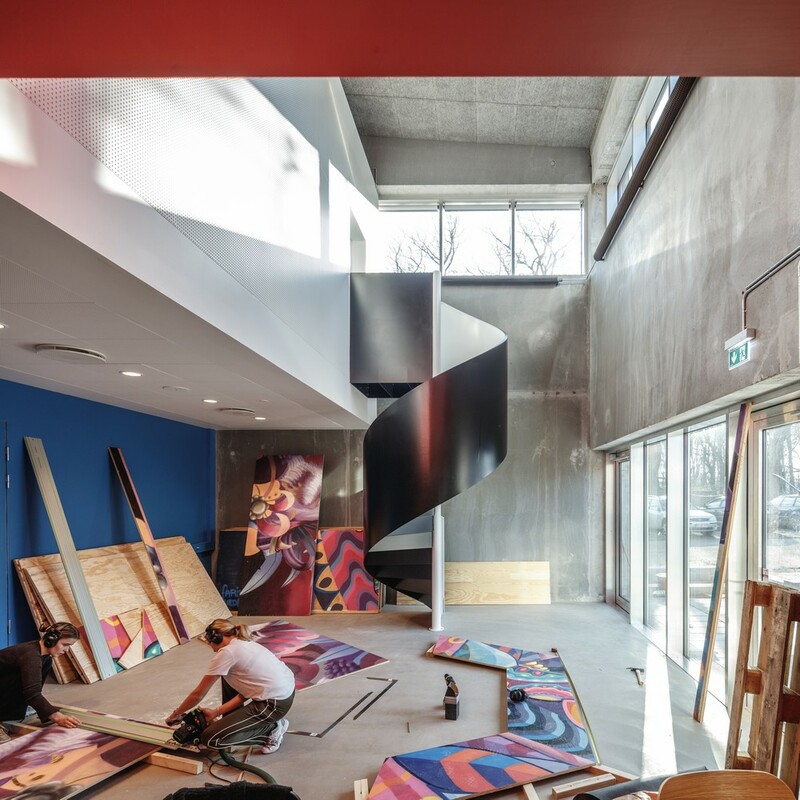 In addition to the Roskilde Festival Folk High School, the area also includes Ragnarock – Museum for pop, rock and youth culture, which opened in 2016, the head office of the Roskilde Group and a master plan for the transformation of the surrounding area. 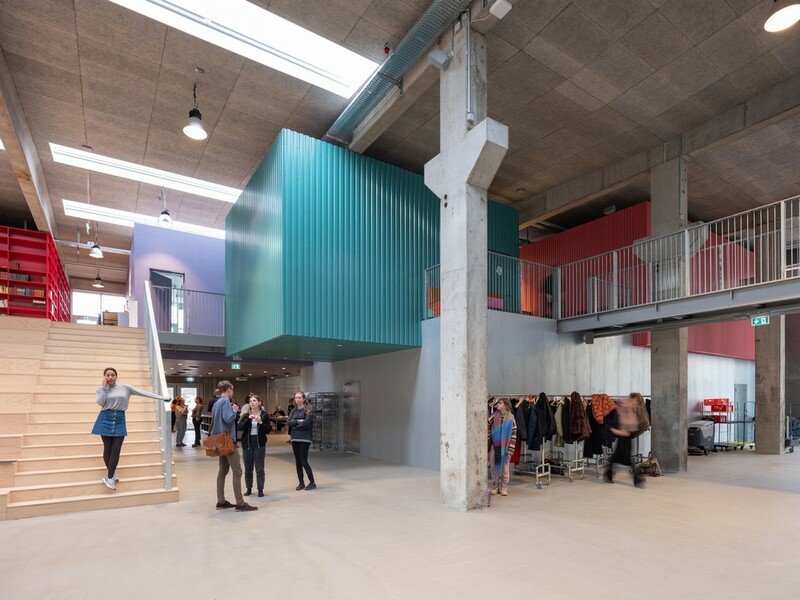 Today’s festive opening includes speeches and student performances throughout the school and the performance of a song written for the event, ‘At Dø Er At Rejse’ (To Die Is to Travel) by the Danish band Nephew, which gives a concert at the school in the evening. Client: Bygningsfonden Roskilde Festival Højskole and the following client consortium consisting of Roskilde Municipality, Realdania, Roskilde Festival Group, A.P. Møller Fonden and Knud Højgaards Fond. Tuborgfondet donated a sum for the interior project. Programme: Folk high school, students’ dwellings, teachers’ dwellings, offices. COBE is an architectural firm founded in 2006 by architect Dan Stubbergaard. 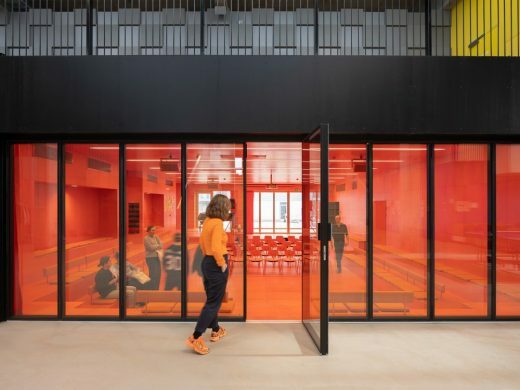 In just twelve years, COBE has earned a position as a leading firm with profound understanding of the role of architecture as a social engine. 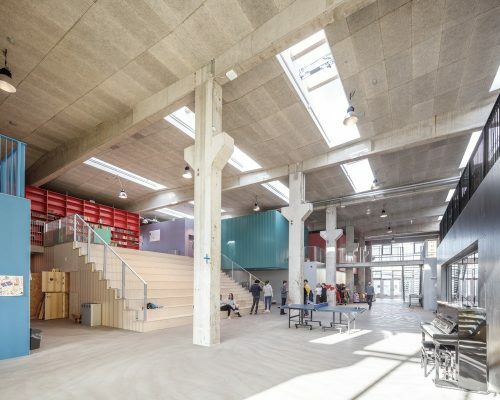 The firm’s projects are informed by the unique potential of the given site and insist on creating added value for the future users and the local community. Among the firm’s most prominent projects are Nørreport Station – Copenhagen’s busiest public transport hub; The Silo and the planning of Copenhagen’s North Harbour (Nordhavn) – Scandinavia’s largest urban development project to date; Halftime – a new iconic building for adidas in the sports company’s headquarters in Germany; Ragnarock, Denmark’s new museum for pop, rock and youth culture in Roskilde; and the development of Paper Island (Papirøen) in Copenhagen.